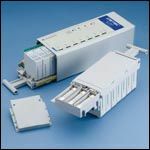 The TDX Modular Series of Surge Protection Devices are designed for critical protection applications. The 100kA to 400kA 8/20µs (depending on model) of surge protection exceeds the IEEE®C62.41.2 Scenario II single shot surge rating requirements for exposed service entrance locations – Exposure 3. The NEMA®-4 weather-tight housing allows the TDX to be installed on indoor or outdoor service panels. The preconfigured connecting leads simplify installation. The unique narrow construction allows the SPD to fit between adjacent panel boards and connect via a 90-degree elbow. A flush mounting kit is also available for installing the SPD in drywall applications for the 100 & 200 models. 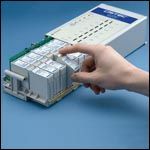 Listed as a Type 1 SPD to UL®1449 3rd Edition, the TDX Modular Series can be installed within a Type 1 or 2 location in accordance with the NEC®2008. * All S models are listed to UL1449 Ed 3 through Intertek (ETL). ANSI is a registered trademark of the American National Standards Institute. cULus is a registered certification mark of UL LLC. ETL is a registered trademark of Intertek Testing Services NA, Inc. IEEE is a registered trademark of the Institute of Electrical and Electronics Engineers, Incorporated. NEC is a registered trademark of, and National Electric Code (NEC) standard is a copyright of the National Fire Protection Association, Inc. NEMA is a registered service mark of the National Electrical Manufacturers Association. UL is a registered trademark of UL LLC.